CPQ can help electronic device businesses beat the competition to market, protect margins and tame a volatile supply chain. The electronic device market is a tough place. Challenges include; a balky global supply chain, razor-thin margins, brutal competition and product life cycles measured in minutes to months. On top of that, supplies and components are subject to heavy environmental regulations and export restrictions. It is a very critical industry; an industry whose products are more essential to the existence of our automated, mobilised and digitalised way of life. Consumer electronics, IoT technology, artificial intelligence, advanced manufacturing, mobility and other high-tech marvels that make our world go are all driven by, supported by and empowered by electronic devices. It would seem that making money in this sector would be easy … think again. Cheap labor, available offshore, makes it impossible for domestic manufacturers to compete from the standpoint of price without investing in automation. Even then, competitive pressures drive prices down and eat up margins. The regulatory burden, highly dynamic demand and short product life cycles all present huge challenges for manufacturers and resellers of electronic devices. CPQ can help address many of these challenges. Here’s how. Getting good ideas to market is all about execution. The electronic device market loves a good idea. The problem is, your good idea can easily find its way to market via a competitor before you get your prototype into the hands of your own production folks. Couple that reality with another truth; that being an even better idea is likely close behind, which will make your idea obsolete in a heartbeat. The point is, you must get your idea productised, marketed, produced and sold as quickly as possible. Being first in the market frequently means you own the market. Second-place arrivals are just a polite way of saying you’ve failed. Product complexities associated with configuration options, pricing complexities, esoteric knowledge and other factors are mitigated with CPQ. Sales reps do not have to spend weeks or months learning a whole new vocabulary, memorising price lists or familiarising themselves with obscure technical data. 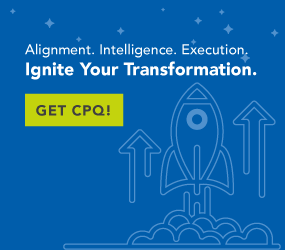 CPQ builds all of that into its unique guided selling, interactive interview process powered by AI and a business rules engine. Product managers, engineers and implementation and marketing specialists all contribute their expert knowledge to the product and option hierarchies and interview scripting used by CPQ. Your sales force is ready to go when the product is ready to sell. Electronics and high-tech are not markets that accept “almost” or “close enough” values in the metrics used to quantify and define problems and solutions. Electronic devices must be built to precise tolerances and perform within defined ranges of acceptable error or with great consistency. The processes used to define and select solutions within these environments must demonstrate consistent application of standards and the delivery of resulting outcomes in compliance with applicable regulatory and legal requirements. Additionally, many supply options for electronic devices come with some environmental baggage that may affect price or even the legal status of the product. In some cases, regulatory limits may prevent the finished product from being sold in markets beyond the domestic arena. With CPQ, sellers and buyers are assured that the right questions are asked and that the answers provided drive the choices offered and configurations recommended for any solution proposed to the buyer. Additionally, this process is entirely able to be documented to support future review of how a solution was configured and why specific choices were made. Compliance is demonstrable during audits or other review processes. Building any specialised, complex product will likely involve comparatively high costs. This is especially true in a market that demands precision, accuracy, consistent performance and extreme quality. Additionally, competitive pressures frequently exert extreme downward pressure on prices and profit margins. The electronic device market is no exception. Product managers and engineers need to design products with quality in mind. Additionally, the manufacturing operations managers need to extend this flexible basic product design concept into their own production processes, planning and scheduling. This approach delivers the economies associated with higher-volume production, and at the same time, facilitates the delivery of highly specialised, low-volume products common to the electronic devices manufacturing segment. It also assures the product will reach the market in the shortest possible time. CPQ is uniquely qualified to facilitate this strategy. Configurations are produced by organising product and option hierarchies and coupling those with selections offered to the buyer. The available selections offered along the way are driven by a combination of buyer input and business rules. CPQ is driven by an interactive interviewing process that starts out with basic usage and environmental questions that determine what basic product is most likely to fulfil the ultimate needs of the buyer. As the question-and-answer process develops and more needs are specified, an increasing level of specialisation is manifested in the configuration produced. CPQ delivers mass customisation. Products are delivered quickly and at the lowest possible cost. It’s hard to go it alone in the electronic device marketplace. Partnerships, both strategic and tactical, are essential to achieving success. Building a production process that can take advantage of advanced manufacturing processes such as additive manufacturing, virtual reality, robotics and other automation technologies requires commitment and expertise. Frequently that expertise is best found through partnerships. Additionally, product security, protection of intellectual property and industrial espionage are all part of the partnership necessity for electronics businesses. CPQ can help smooth the inclusion of strategic partnerships into your production processes, your distribution and sales strategy and your internal security tactics. CPQ as an app is well-suited to communicate with and operate with all manner of production automation technologies. The benefits of these technologies are exploited and used by CPQ to ensure that the product is configured, built and delivered to match your customer’s specific needs. Expanding your market reach or introducing new products into your existing sales channel are expedited with CPQ. Sales reps are quickly turned into product experts without having to spend weeks out of the field learning about new solutions offered. CPQ assures the buyer and the seller that everyone understands specifically what is included in the product and specific configuration being ordered and that the price quoted is fully aligned with the value of the solution delivered. CPQ delivers the capability and facility to thrive in the highly competitive high-tech marketplace. This market offers great opportunities to manufacturers, but the market requires tight cost controls and close attention to the elimination of wasteful practices or lean operations. CPQ makes the difference in electronic device businesses.